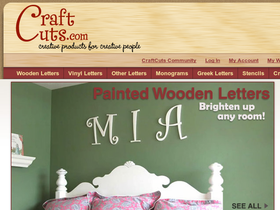 Craft Cuts, online at craftcuts.com, is the source for a wide selection of decorative wooden letters and wall letters. Craft Cuts offers a creative touch to home with letters in a large variety of styles, including unpainted wall letters, monograms, painted wall letters, letters for kids, and much more in your choice of font and color. Craft Cuts offers Greek letters, vinyl letters, wall stencils, home decor, seasonal items, holiday decor, and more. But before you shop, get all the latest craftcuts.com discounts, Craft Cuts promotions, and Craft Cuts coupon codes found here at RetailSteal.com. Craft Cuts offers shipping to the United States, Alaska, Canada, and internationally. See site for shipping options and rates. Enjoy 10% savings on all MDF Wooden Letters from Craft Cuts using this coupon code. Click link to shop and save. Shop for unpainted wood letters, starting from $0.50 from Craft Cuts. Click here to shop. Shop for wall art decorative ends from just $1.15 from Craft Cuts. Click here to shop. Purchase mounting products from only $3 from Craft Cuts. Plus enjoy free samples with select purchases. Click link to shop. Shop at Craft Cuts for painted MDF wood letters starting from $5.80. Click link now to shop. Shop for hanging wooden letters, starting from $8.30 from CraftCuts.com. Click link now to shop. Shop for custom picture frames, starting from $22.50 from CraftCuts.com. Shop today. Shop at Craft Cuts for custom made wall decor, wall letters, and more. Click here to make yours today.